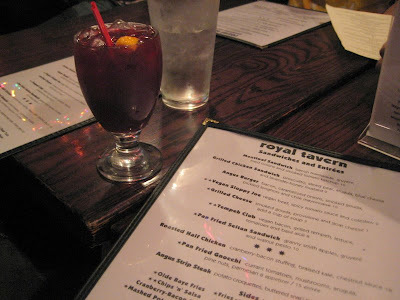 When thinking of a place to eat on saturday night, I remembered that the food network had just named the best burger in PA, and so we headed off to the Royal Tavern. 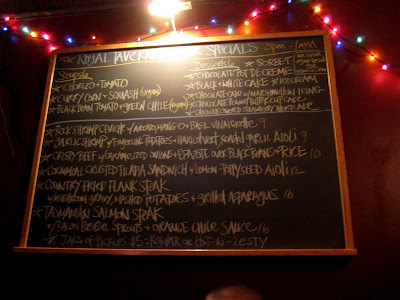 Their specials chalkboard menu made me want it all. Seriously. Especially all of their soups and desserts. The country fried flank steak and the tasmanian salmon steak both looked crazy good. They had a couple of derby day drink specials. J and O both got some pomegranate sangrias. 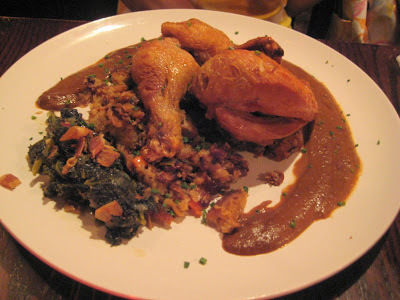 M got the roast chicken entree. This thing was ginormous. I think she took like… 3 small bites. I felt bad about all that leftover food. I would have so eaten that drumstick. Both J and O got the burger. This thing is rather unwieldy. 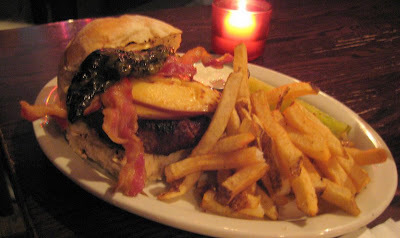 It’s a thick burger, with bacon, caramelized onion, smoked gouda, and a fried long hot pepper, all in between a thick brioche bun. It’s like thick upon thick, which results in unwieldy. But they both agreed it was a good burger. I got a meatloaf sandwich, which also included chopped bacon, provolone, fried onions and porcini mushroom ketchup, on ciabatta bread. Holy lord was this good. I did not expect this to be so good. First off, the meatloaf was good. Secondly, everything else on it was amazing, especially the onions and the ketchup. I scarfed this down like I hadn’t eaten in days. It’s amazing how much food I can shove in my mouth. I think it’s like my favorite sandwich in Philadelphia now. All of the sandwiches are served with fries, and a garlic aoili sauces comes with too. This sauce also rocks. Service was fine. This place is pretty small. We got here fairly early so it was easy to get a table, but I can see why this place gets crowded. So get here early if you want a table, or you’ll end up waiting a long time or standing at the bar. It’s dark and moody here too, but the christmas lights lighten it up a bit. You read my mind. 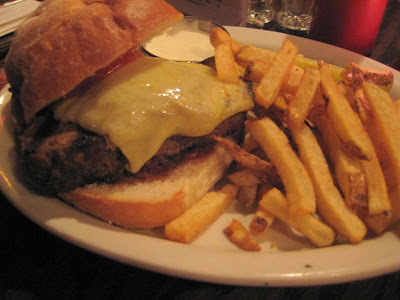 As soon as I saw it was named top burger< I decided I needed to head out to the Royal again. It's going to have to be mighty good to top Sketch.